It has been shown that the hydrothermal–catalytic conversion of solid natural asphaltite of the Spiridonovskoe oilfield (Republic of Tatarstan) at 250°C in the presence of hematite yields liquid products with a reduced amount of resins and asphaltenes. At the same time, a dispersed phase of insoluble carburized substances of the carbene and carboid types appears in the conversion products. The structural-group and molecular compositions of oils in the liquid products of conversion, which are enriched in aromatic, polycycloaromatic, and carbonyl-containing structural units and sulfoxides according to 1H NMR and IR data, have been determined. It has been established that the molecular composition of oils from the initial asphaltite and its conversion products is almost the same, but there are changes in the relative amount of various types of compounds. A low concentration of alkanes and an increased concentration of triterpanes characterize the initial Spiridonovskoe asphaltite as a biodegraded object. In the conversion products, the relative amount of alkanes has sharply increased and the concentrations of tri- and tetracyclic aromatic hydrocarbons (HC) and dibenzothiophenes have become greater. 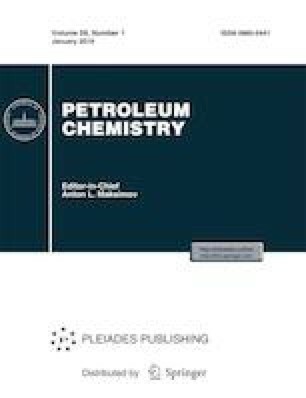 The proportion of phenanthrenes and tetracyclic aromatic hydrocarbons has increased by factors of 9.3 and 2.6, respectively, and alkylcyclohexanes have been identified, which are absent in the original asphaltite. But the relative amount of polycyclic naphthenes (pregnanes, steranes, cheilanthanes, and hopanes) significantly decreased. The revealed differences are apparently determined by the scale of generation of these compounds by the degradation of resins and asphaltenes, in which the compounds occur as structural units of molecules or in an adsorbed and/or occluded form. The authors thank the Tomsk Regional Center for Collective Use at the Tomsk Scientific Center (Siberian Branch, Russian Academy of Sciences) for kindly providing access to the instruments Nicolet 5700FTIR spectrometer with a TermoElectron Raman module and Termo Scientific DFS high resolution mass spectrometer.